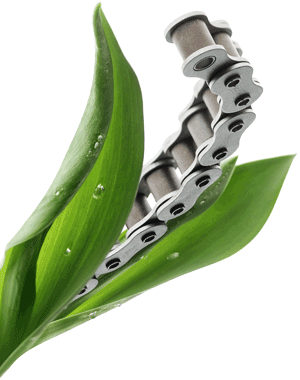 Tsubaki's NEP chain (New Environmental Plating Chain) was developed to replace all surface coated chains containing designated hazardous chemicals. NEP chains are RoHS compliant. It has superior corrosion resistance compared to our WP and DP series chains without any strength reductions. NEP chain parts are individually treated and unlike chains treated only after assembly. NEP chains are available in standard ANSI single and double pitch chains with and without attachments and large size conveyor chains.